Study Hall is a co-working space for freelancers and remote workers by day. By night and weekends, it is an event space for community talks, workshops, parties, small weddings, etc. Co-founded in 2016 by Alli Berry, Tad Cooke, and Jackson Latka, Study Hall offers an inspirational space to work while in downtown Burlington and away from the distractions of a home office. As a work club, it has the buzz of a typical office layered with a communal atmosphere and of course, coffee and treats (like Miss Weinerz's Donuts...yum!) to keep coworkers going. We are excited to have our first showcase hosted by Study Hall and thankful to Leah Fishman, Community Manager, for helping us with the logistics for the event. 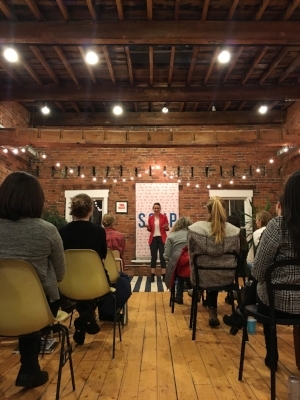 If you're interested in hosting an event, a meeting, or looking for a reasonably priced co-working space, reach out to them at hello@studyhall.space or come by to take a tour. By evening and weekend, an event space. A presenter pitching her idea at SOUP, an event hosted by Study Hall to support creative projects in VT.